This week I’m tackling one of my favorite topics surrounding thyroid health – stress! 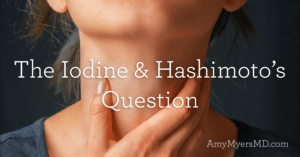 Whether you have Hashimoto’s or hypothyroidism, Graves or hyperthyroidism, or you haven’t been diagnosed yet, stress and your adrenals play a huge role in your thyroid health. The truth is, stress is just a given in most of our lives – I know I sure can’t avoid it. However, that doesn’t mean there’s nothing we can do about it. 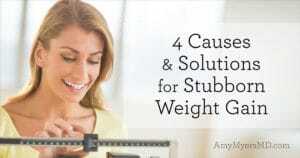 The key is to understand how it impacts thyroid function, and most of all, how to relieve it! You probably know your adrenal glands for producing adrenaline and managing your fight or flight response, but did you know that, as part of your endocrine system, they also produce hormones that impact your major metabolic processes, just like your thyroid? The hormones produced by your adrenal glands help to regulate blood pressure, electrolyte balance, blood sugar, immune response, digestion, and more. When you experience stress, be it emotional, mental, or physical, your hypothalamus sends a signal to your pituitary gland, which in turn signals to your adrenal glands to produce and release a series of stress hormones, including cortisol. Cortisol functions in a negative feedback loop with the hypothalamus and pituitary gland, meaning that once it enters your bloodstream, its presence signals to your hypothalamus and pituitary gland to slow down (so that they don’t trigger any additional stress hormones). But, since these organs regulate thyroid hormone production as well, that gets slowed down too. Stress hormones affect the enzymes that convert T4 to T3. Remember that Free T3 (FT3) is the active form of the hormone and I like to think of it as the ‘gas,’ and Reverse T3 (RT3) is the inactive form of the hormone and I like to think of it as the ‘brakes.’ When stress is high we convert more of our T3 into RT3 rather than FT3. 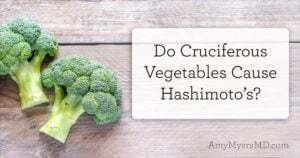 This imbalance essentially works to put the brakes on all of your metabolic processes, slowing them down and causing hypothyroid symptoms. Also released in the stress response are inflammatory immune cells called cytokines, which make thyroid receptors less sensitive to thyroid hormones. This means that even if you’re taking thyroid medication and your thyroid hormone levels are normal, you can still be suffering from underactive thyroid symptoms. One side effect of prolonged coristol elevation is that it can cause excess estrogen to accumulate. This extra estrogen increases levels of thyroid binding globulin (TBG) which is the protein that allows your thyroid hormones to travel through your bloodstream. When thyroid hormones are attached to TBG they remain inactive, so T4 can’t be stored in your tissues or converted to Free T3. 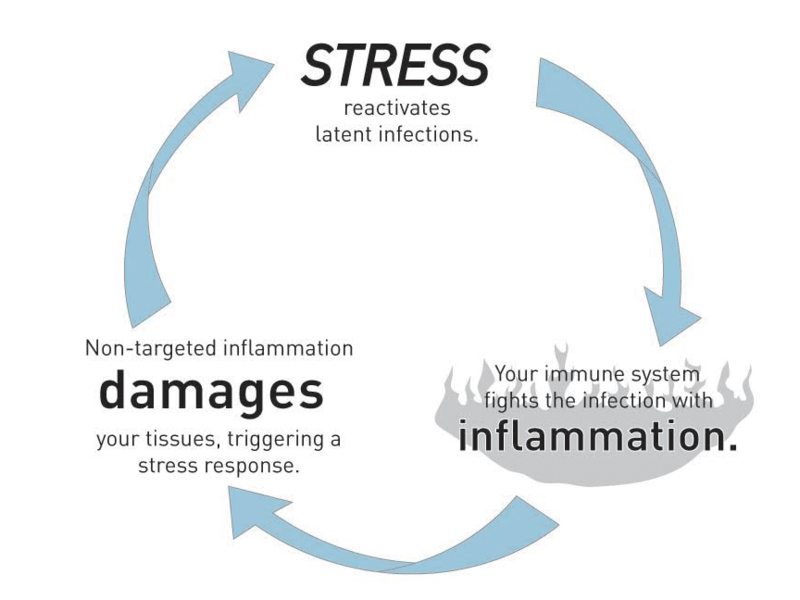 While your body is in stress mode your immune system is suppressed, partially so that your body can focus fully on overcoming the stressor, and partially because stress causes inflammation, so your immune system slows down to prevent a state of chronic inflammation. 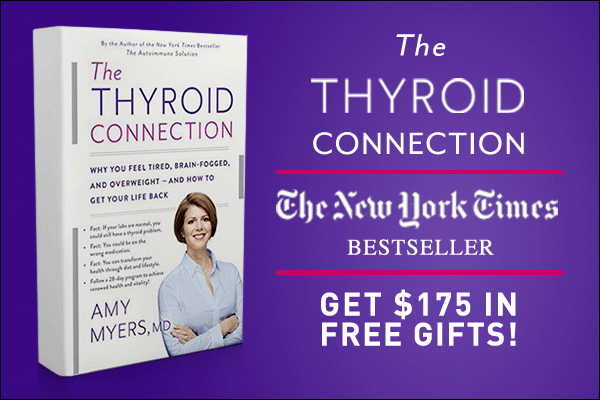 As I explain in my book, The Thyroid Connection, a suppressed immune system can trigger latent viral infections, some of which can trigger autoimmune thyroid disease. Furthermore, if you experience multiple episodes of chronic stress, causing your immune system to rev up and slow down repeatedly, you are at greater risk of your immune system overreacting and triggering an autoimmune response. As part of suppressing your immune system, cortisol weakens your immune system’s primary barriers – the blood-brain barrier, lungs, and gut barrier. As we know from Part II of this series, a weakened gut barrier leads to leaky gut, which sets you on the path toward autoimmune disease and releases gluten and dairy (among other things) into your bloodstream, both of which can trigger attacks on your thyroid via molecular mimicry. 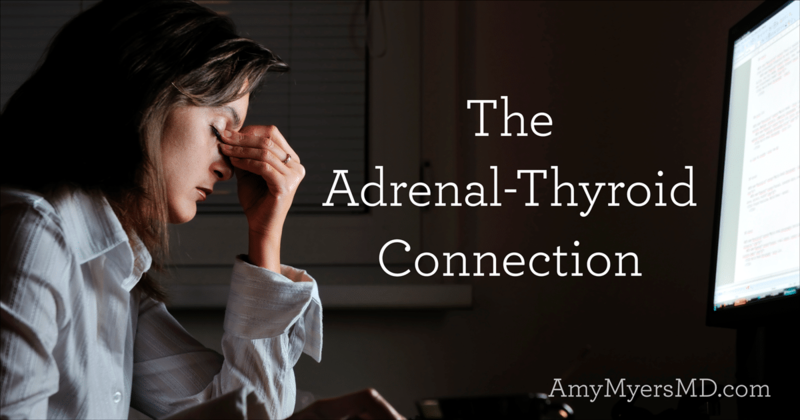 As you can see, your adrenal function plays a huge role in the effectiveness of your thyroid hormones, and it is very important to determine if adrenal stress is an underlying cause of your thyroid problems so that you can treat them side by side. In fact, many patients with adrenal-related thyroid problems who are put on thyroid medication without adrenal support initially get worse, experiencing a racing heart or shaking hands as their body is forced into overdrive from the sudden rush of thyroid hormones. Conventional doctors typically rely on a blood test to measure cortisol levels, but since your stress hormone levels fluctuate significantly throughout the day, the one-time test does not provide very nuanced results. Instead, I prefer an at-home saliva test, or, for a basic gauge of your adrenal stress, you can use a symptoms checklist. In my clinic, I use a saliva test from BioHealth Laboratory to measure stress hormone levels at four different points throughout the day, which provides a more complete picture. You can order your own adrenal profile from My Labs for Life and my Wellness Coach, Dana, can review your results and work with you on dietary, lifestyle, and supplement changes to support your adrenals. 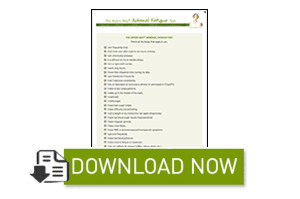 If you are unable to use a saliva test, or do not feel that formal testing is necessary, I have a basic symptoms checklist test in both of my books, The Thyroid Solution and The Autoimmune Solution, that will give you an idea of your degree of adrenal fatigue. You can also download a PDF version in the link below! The best way to support your adrenals and accompanying thyroid problems long-term is to learn to manage your stress. Realistically speaking, there will probably always be stress in your life, but learning the tools and routines to leave a stressful situation behind you after it’s over instead of carrying it around with you will dramatically reduce the physical effects of chronic stress. HeartMath Inner Balance App – I love the Inner Balance app for iPhone. It uses an external sensor on your earlobe to help you synchronize your heart rate, breath, and mind. It’s super easy to use, and convenient since I always have my iPhone with me. Plus, as a very goal-oriented person (yes, even in my stress reduction! ), I love that it lets you set goals and track your progress. Infrared Sauna Therapy – Spending time in an infrared sauna has many health benefits, including stress relief and detoxification. I personally have one in my home, and you can also receive treatments from natural spas that house their own. Relaxing Hot Bath – I love winding down my evening with a relaxing hot bath. For a little extra pampering and relaxation, check out this week’s recipe for a DIY Calming Lavender Body Oil Scrub. Adaptogenic herbs help the body adapt and cope with stress. This is my go-to treatment to support the adrenal gland, as we work together to find the root cause of your adrenal fatigue. The one I carry in my store is The Myers Way® Adrenal Support, which is a blend of Rhodiola rosea, Panax ginseng, and a number of other herbal extracts. All B vitamins are critical for the chemical processes within the adrenal glands, which makes my multivitamin ideal for adrenal support as it contains all 8 B vitamins in their pre-methylated forms. For added adrenal support, you can also take omega-3 fatty acids, vitamin C, and magnesium.